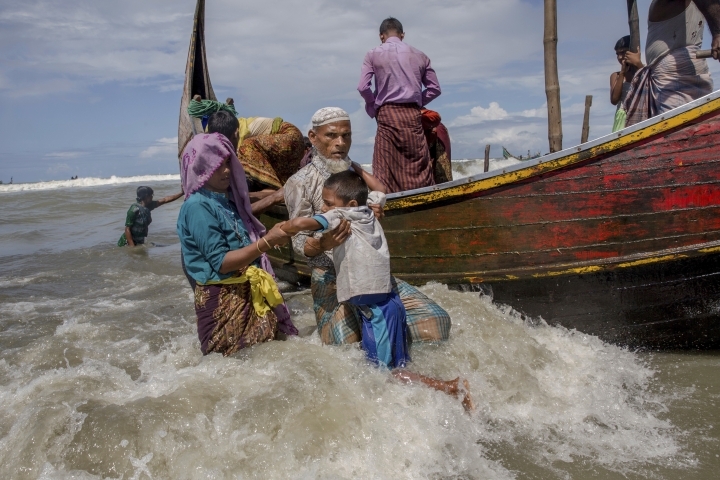 COX'S BAZAR, Bangladesh — Nearly three weeks into a mass exodus of Rohingya Muslims fleeing violence in Myanmar, thousands were still flooding across the border in search of help and safety in teeming refugee settlements in Bangladesh. 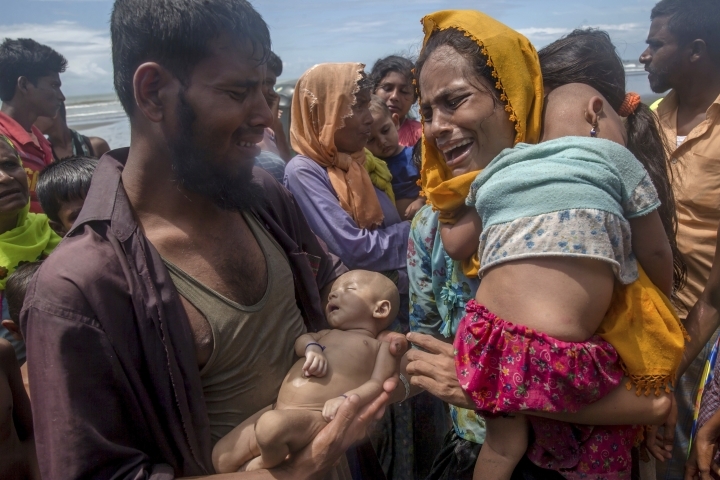 The crisis has drawn global condemnation, with U.N. officials demanding Myanmar halt what they described as a campaign of ethnic cleansing that has driven nearly 400,000 Rohingya to flee Rakhine state. 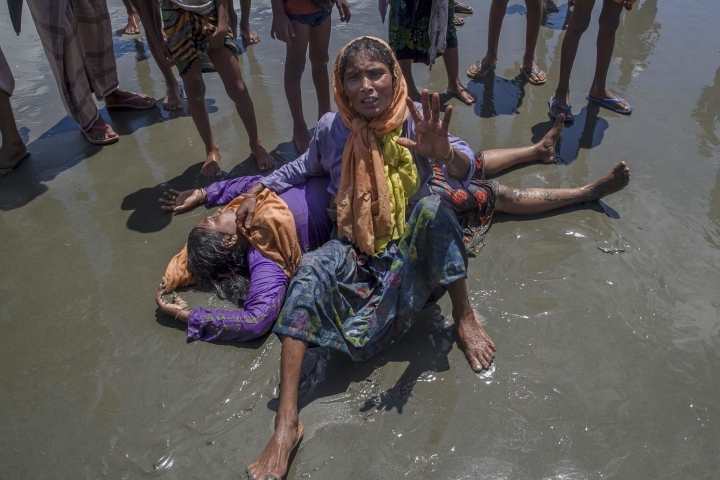 Those who arrived Wednesday in wooden boats on beaches near Shah Porir Dwip fishing village described ongoing violence in Buddhist-majority Myanmar, where smoke could be seen billowing from a burning village — suggesting more Rohingya homes had been set alight. 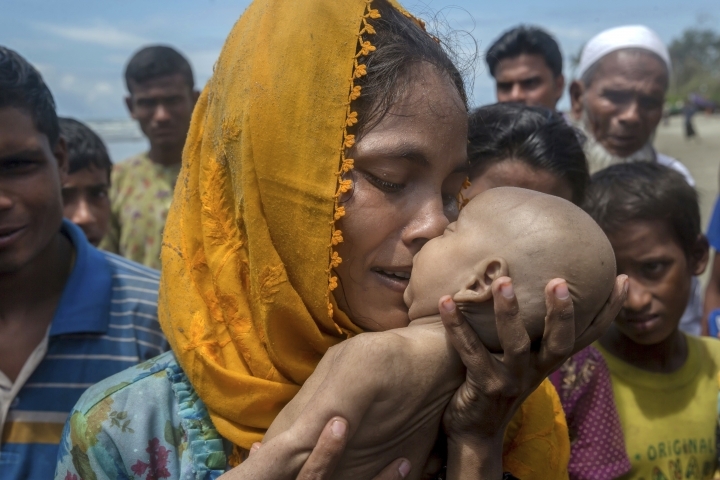 Myanmar has accused the Rohingya of burning their own homes and villages — a claim the U.N. human rights chief criticized as a "complete denial of reality." U.N. spokesman Stephane Dujarric told reporters at U.N. headquarters on Thursday that 10,000 people reportedly crossed the border that in the last 24 hours. 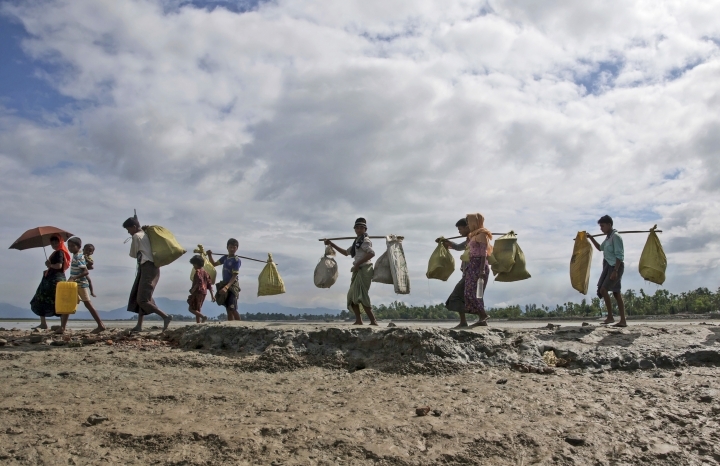 Combined with the Rohingyas who fled during the last round of violence in Rakhine state last October, Dujarric said "it's estimated that some 40 percent of the total Rohingya population have now fled into Bangladesh." 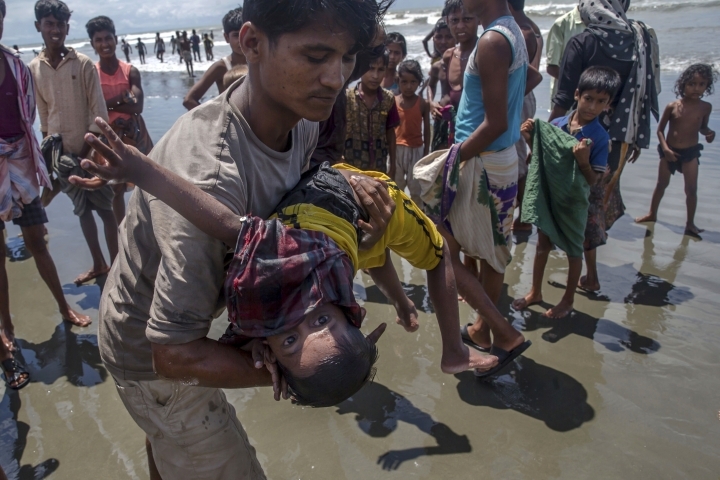 An estimated 60 percent of the Rohingyas arriving in Bangladesh are children, Dujarric said. U.N. Secretary-General Antonio Guterres told reporters Wednesday that ethnic cleansing was taking place against Rohingya in Rakhine state. The term "ethnic cleansing" is defined as an effort to rid an area of an unwanted ethnic group — by displacement, deportation or even killing. 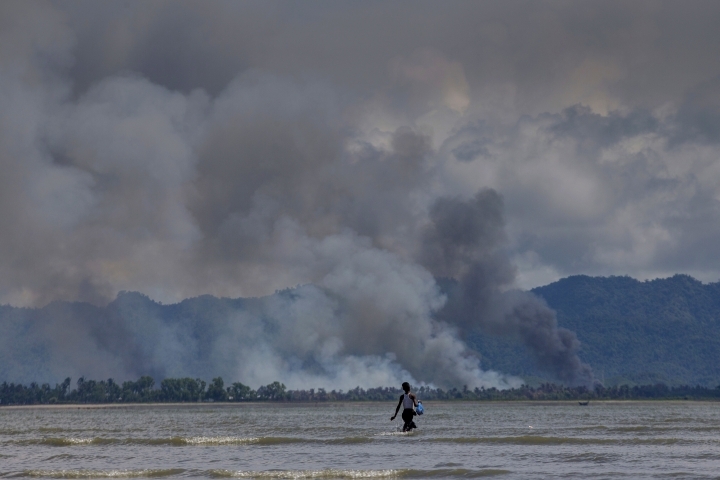 And Amnesty International said Thursday that it has turned up evidence of an "orchestrated campaign of systematic burnings" by Myanmar security forces targeting dozens of Rohingya villages over the last three weeks. The U.N. Security Council has called for "immediate steps to end the violence" and ensure civilian protections. 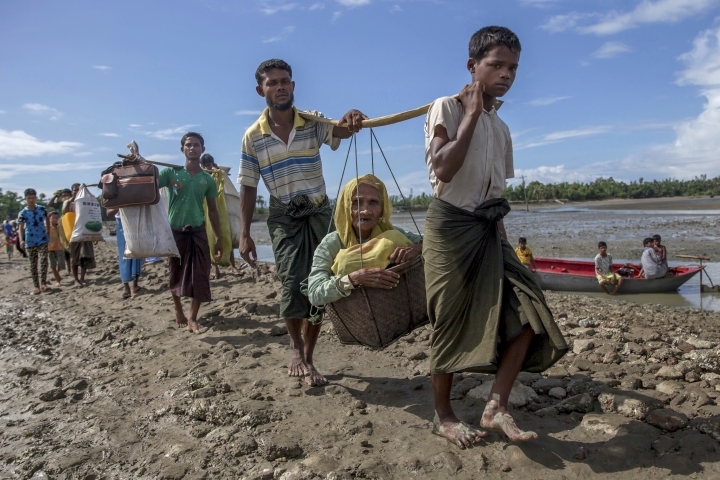 Rohingya have faced decades of persecution in Myanmar, and are denied citizenship despite centuries-old roots in the Rakhine region. U.N. High Commissioner for Refugees Filippo Grandi said humanitarian assistance would increase "very, very quickly." Asked why the response has been slow, Grandi alluded to difficulties working in Bangladesh, but said he hoped this will change as the scale of the crisis becomes more apparent. Yasin reported from Shah Porir Dwip, Bangladesh. Associated Press writers David Keyton in Stockholm, Sweden, and Edith M. Lederer at the United Nations contributed to this report.